Sealtest Variety Theater features movie actress Dorothy Lamour as host of her own variety series. 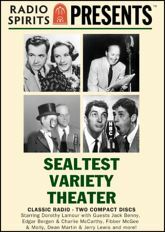 With a delightful mix of comedy and music, and special guest appearances by Jack Benny, Fibber McGee & Molly, Dean Martin & Jerry Lewis, Eddie Bracken, and Charles Laughton, these four episodes from this short-lived but wonderful series are sure to please lovers of classic radio entertainment. Also appearing as guests are Edward Arnold, George Murphy, and Veola Vonn.